We got a dog and bone for our brother-in-law. 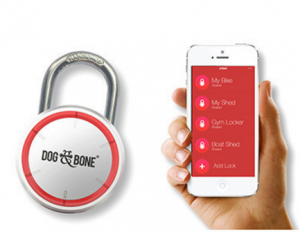 It’s not a pet, but a new “smart lock” from a company called Dog & Bone. The “Locksmart Keyless Bluetooth Padlock” is big and almost as heavy as it name. It costs $90 at places like Radio Shack and can be locked and unlocked by an app on your smartphone. Anyone you want can use this app on their own phone to work it. Or, if you have more than one padlock (lots of sheds, a few lockers, and so on), you can manage all the smart locks (at considerable expense) from your phone. At first Joy was going to use it on her locker when she went swimming at the pool. But if you put your valuables in the locker, you have to keep the phone out of the locker or you won’t be able to open the locker. But the phone is probably the most valuable thing you have at the pool — so you would want to have a regular lock for another locker so you could put your cell phone in that one. Then when you wanted to get dressed and leave, you would open that locker with a key so you could get to the phone to open the other locker with the …. We have never fully understood the sophistication of high-tech design.